Leading Exporter of technovate hamecson rotary two post lift from Mumbai. Symmetric Lift with asymmetric arm design provides more pick up points. Two Heavy duty hydraulic cylinders designed to minimize down time by requiring least maintenance. Spring operated arm restraints disengage at floor level. Self setting locking system with easy to reach lock latch handle. Padded shut off bar to control lifting height. SUV/MUV adapters and brackets included. 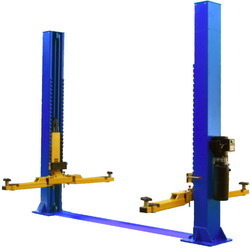 Looking for Vehicle Lift ?